Note: The occupational terms marked with an asterisk are also applied to workers doing similar work on the surface for other workers above ground, see (056). keeps in repair underground air passages, or conduits for ventilation purposes; timbers up, when necessary, and removes fallen debris with pick and shovel. 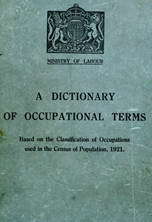 an underground labourer q.v. who also performs timbering work; in some districts, cf. . back-bye deputy (051). rides with setts of tubs or trams, to couple and uncouple haulage ropes at sidings. general term for men on "bargain," or contract work, paid for at an agreed rate for a given volume or weight, whether getting ore, driving roadways, clearing stone, etc. ; usually works on his own account; cf. contractor (051). (ii) occasionally denotes driller q.v. operates rotary boring machine, in crown of which diamonds are set, to obtain solid cores of strata bored through. controls speed of trams or setts of tubs at top of inclines on haulage roads by applying brakes to the drum round which the haulage rope winds. receives and attaches tubs to (or detaches tubs from) the rope at top of underground brow or incline and pushes tubs away from landing point. as for change house keeper (056), working underground. see onsetter ; cf. banksman (056). drives and attends to horse drawing tubs of iron ore underground; cf. carter (056). keeps buckets and clacks (or valves) of old bucket type of pumping (engine in order; changes buckets when necessary; obsolescent , work now done by pump doctor q.v. accompanies and assists day wage worker, e.g., pumpman, working alone in isolated districts. general terms for all workers, above or below ground, receiving fixed time rate of wages, including haulage hands, shafters, labourers q.v. superintends work of pony" drivers and leaders. makes drifts or roadways for purposes of exploration or of ventilation, by drilling or blasting; removes debris in a tub or tram. a driller q.v. who changes drills as required, when holes for blasting are bored by power drills. drills, by hand or machine, hole for blasting, and inserts charge; cf. driller and, shot-firer. (ii) may also drill or bore for exploration of strata, etc., see borer. drawer, horse boy, horse drawer, horse driver, horse leader, leader, pony driver, wagon driver; a haulier q.v. who leads or drives ponies or horses which pull tubs between face of workings and sidings, and also above ground. attaches and detaches tubs or bogies to and from endless rope, at top or bottom of incline, at pass- bye, or at pit bottom. receives tubs arriving along mechanical haulage road; takes them to siding, where they are attached to another haulage system, sent up shaft or otherwise moved. fills kibbles, skips, tubs, trams or wagons with ore or refuse, by hand or with shovel, for conveyance away from working place. attends to ventilating furnace, placed near bottom of upcast shaft, to maintain upward current of hot air, and thus ensure circulation; obsolescent . takes drills and picks to smithy for sharpening and brings them back to workmen when sharpened. gets ore at underground working face by hand with hammer and wedge or by breaking down rock, already undercut by holer, with pick and bar; in some mines may also drill ore, fire shot and load into tubs. greases tub and bogie axles, and sheaves and drums guiding haulage ropes. general term for any person moving tubs or wagons in mine; couples and uncouples tubs, if necessary; in particular denotes underground pony drivers. helps trammers q.v. in pushing or hauling tubs, trams, or bogies up dip or bank. holes, or undercuts by means of a mechanical cutting machine, mineral to facilitate its getting; also removes material overlying or underlying bed of ironstone in mine, using pick bar and shovel. operates machine used for "holing," i.e., making opening or road for connecting one part of mine with another. is in charge of horses and stables below or above ground; grooms and feeds horses and attends to the harness. (ii) controls switch points on rails at top or bottom of incline. is employed at junctions or extremities of haulage system to couple or uncouple tubs as they come on or go off rope. (ii) assists driver by leading horse hauling tubs to and from working places. (ii) more generally used to denote any underground worker in a mine; usually specifically designated, e.g., lead miner, blende miner. a getter q.v. getting mineral by hand, and not by machine. does work other than actual getting of ore, e.g. filling, trailing, tramming or putting, in working places, and assists miner generally. stands at bottom of shaft to put full tubs into cage and remove empty ones; also signals to winding engine- man for raising or lowering of ca.ge by means of hell signals. chips away foreign substances from haematite rock got at working place, to clean ore; breaks up and sorts ore below ground; cf. dresser (056). takes samples of ore- bearing rock, crushes them and examines by visual and simple chemical means to ascertain percentage of metal contained in the ore.
sorts ore into different grades which has been cleaned and broken up by ore dresser; sometimes also does work of ore dresser q.v. packs away waste material in worked-out places; also builds stone into columns, piers, or walls, for supporting roof or for preventing waste material from falling into haulage ways. picks over, and sometimes sieves, contents of tubs, trams, or bogies, to estimate deductions in weight for dirt, stone (metal), etc. a pipe fitter (252) q.v. who carries out- any necessary repairs or keeps in order pipes conveying compressed air or water to machines for drilling, etc. does any odd work in mine. weighs out and carries round charges of explosives required for drilling and keeps record of same. operates, i.e. starts and stops pumps and pumping engine; keeps parts oiled and cleaned; makes necessary adjustments; also packs glands, overhauls valves, etc. works hand pump for draining working places. a trammer q.v. who pushes tubs by hand or draws with pony. a driller q.v. who uses hand drilling machine on ratchet principle. scavenges under and above ground roads, and keeps them in good condition for traffic. examines face and brow of quarry to ensure that it is in safe condition for men working below. guides, with hook, haulage rope as it passes on to drum. runs in and hooks on or hooks off and runs out, tubs, trams, or bogies on endless rope haulage system; cf. landing lad. examines and keeps in repair ropes used (chiefly for haulage purposes) in or about mine. in large mines, is responsible for the main ten an ee of ropes, oiling, re-socketing, splicing, etc. ; sometimes does work of rope guider q.v. accompanies sett of tubs on haulage road for purpose of attaching them to haulage rope or detaching them therefrom; guides rope round pulleys, guides tubs round curves, etc. ; cf. hank rider. in Cornwall , conveys ore along underground ways in wheelbarrow. attends to sanitary conveniences underground. goes down the shaft daily on top of cage and carries out an examination of the sides of the shaft, guide ropes, fangs, pulleys, cages, etc. ; carries out necessary repairs and makes a. report daily to the engineer (050) q.v. a belt man q.v. who separates ore from worthless shale. works at night, when mine workers are absent, repairing roadways, etc. ; in lead mines see timber- man; cf. packer. charges hole, previously bored by power-drilling machine, with explosive, and fires it by lighting a fuse or by electricity. attends to coupling and uncoupling, and marshalling, of trams, tubs, or wagons, when they are hauled along levels underground by means of locomotives; in iron ore mines, attends to landing, or pass- bye, on haulage road. makes up setts of tubs, and couples haulage rope to them, attends to tubs as they come on or go off rope at junctions or sidings on haulage road; and controls movements of tube in sidings generally. a boy who acts as signalman q.v. attends to signals used on haulage road or at shaft, by striking a rod with a piece of wood or metal or by pulling levers which cause the hammer of a bell to strike. attends to transport of skips; keeps in repair roads along which skips are hauled, and generally supervises haulage. assists onsetter q.v. by lifting cage snecks (or latches) when tube, trams, or bogies are being put in or taken out of cage. in Scotland, moves points on tramway. attends to small steam or compressed air pump, used for pumping water, and known as "special" pump. sets up spraggs, or short props, to prevent falls of stone and ore; work usually done by getter. a miner q.v. who works ore away in steps or "stopes," either by "sinking" (underhand stoping) or by "rising" (overhand stoping); work performed by blasting and drilling. cuts and sets timbers, supports, ladders, cribs, and chutes, in and about mine shaft; constructs sumps for water drainage, and timbers them. attends to switch, or points, controlling movements of tubs, etc., at junctions of rolleyways, etc. watches level of water in sump holes from which water is being syphoned and closes syphon valve before water falls so low that air would be let into syphon pipe; usually has other duties in road or pump maintenance. has charge of telephone exchange underground. withdraws timber supports no longer required as working face advances, or supports which have been broken. props up with timber, where necessary, roof and sides of traffic roads in mine; cf. deputy, backbye (051). keeps miners supplied with props, planks, brattice, and crown trees, etc. loads trains with timber for use in mine. conveys tubs, trams, or bogies containing ore or rubbish along haulage roads to sidings or to shafts, and brings back empty trams, etc., to working places. (ii) (tin mines) keeps tramway, along which trams are drawn or pushed, clean and in repair. is engaged in opening and shutting trapdoors in airways of mine, to allow horses, tubs, etc., to pass. a getter q.v. who raises ore in certain area, for which he receives from owner certain proportion of value of ore raised. a bargain man q.v. ; in iron mines, more particularly a bargain man engaged on smaller jobs; in copper mine-s, more particularly one engaged on development work, e.g., sinking shafts or driving levels and crosscuts. attends to roads or planes along which wagons, tubs, bogies, or trams are hauled by mechanical power: carries out necessary repairs to rails, etc., fixes or refixes pulleys and keeps rollers in order. removes water from workings, where quantity is too small to be worth pumping, bv haling it into a tub and conveying it to a place in which it runs away by gravity; sometimes also takes or gets in a supply of drinking water for ponies. breaks up ironstone, with wedges and hammer in ironstone quarries; in a mine is usually done by miner q.v. operates windlass (hand or power-driven) used for hoisting or hauling.